After a heroic move-out effort by Lab members and volunteers, and a month of being a “virtual Lab” operating out of a storage locker, Loomio group, and pop-up event spaces (thanks, Bytes.co!) 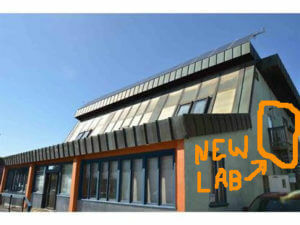 we’re pleased to announce that Laboratory B once again has a space! After considering several possibilities, our membership voted to move into a room on the second floor of 12-22 North Street in the Old North End. In addition to our new HQ space, where we’ll be holding public hours, meetings, co-working sessions and small workshops, the lease also gives us access to a number of shared spaces we can use after business hours, including a dedicated electronics lab, a sizeable class/event space on the first floor, and basement storage. Handicapped Accessibility for Many Events: In the Soda Plant, all of our space was up a set of steep stairs, limiting accessibility of workshops and other events for folks with mobility challenges. 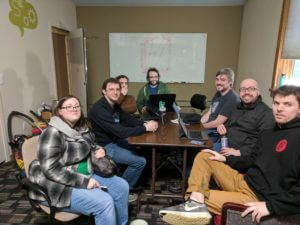 While the Lab’s dedicated room is similarly only stair-accessible, our ability to reserve the large downstairs space means that many of our public-facing workshops and events, such as mobile security night and LAN parties, will take place in accessible spaces. Direct Access to Our Space In Off Hours: In the Soda Plant, the outside door was usually locked after 5pm, so public event attendees needed to ring a doorbell and be guided through a labyrinth to access the space. So, we’re every excited that our new space has a door opening directly to the outside. Space that is more fully “ours”: At the soda plant, we were subletting from Brandthropology, who were incredibly accommodating partners, but pretty much all of our space was at least somewhat shared, in they needed to walk through our main room to get to the shared Couch Room and kitchen. We now fully control our core space, while also having access to additional shared spaces and resources in the building. We’ll be spending the next few weeks moving in and setting up, and are planning to host a “Lab Warming Party” for our initial Thursday public hours on February 21 from 7-9pm. For more details, check the Facebook event, and, as always, keep an eye on our calendar for upcoming Lab B happenings!